For more than twenty-five years in public service, Robert Francis Kennedy was at the center of the most important political and legal developments of his time. The younger brother, by five years, of President john f. kennedy, in whose cabinet he served, Bobby Kennedy held a number of roles in government: assistant counsel (1953–55) and chief counsel (1955–57) to the Senate Permanent Subcommittee on Investigations, chief counsel of the Senate Rackets Committee (1957–59), U.S. attorney general (1960–63), and finally U.S. senator from New York (1965–68). His major endeavors included probing union corruption in the 1950s and implementing White House policy on the Civil Rights Movement in the early 1960s. He was assassinated in 1968, like his brother before him, while campaigning for the presidency. Born into one of the United States' most powerful political dynasties, on November 20, 1925, in Brookline, Massachusetts, Kennedy was the third son of Joseph P. Kennedy and Rose Fitzgerald Kennedy. Great things were expected of the Kennedy sons, and the means were provided: $1-million trust funds, entrance to the Ivy League, and later, leverage to see that they held government positions. Kennedy's father, a business magnate and former U.S. ambassador to Great Britain, doted on the shy, bookish, and devoutly Catholic young man. His father thought Kennedy was most like himself: tough. Kennedy was educated at Harvard College, interrupting his studies to serve in World War II as a Navy lieutenant, following the death of his eldest brother, Joseph Patrick Kennedy, Jr., in the war. He served aboard the destroyer Joseph P. Kennedy until being discharged in 1946, then returned to Harvard, where he played football and earned his bachelor of arts degree in 1948. He next traveled briefly to Palestine as a war correspondent. Marriage to Ethel Skakel followed in 1950, and a law degree from the University of Virginia in 1951. Kennedy and his wife had eleven children over the next eighteen years. Kennedy's rapid ascent in national politics began immediately upon his admission to the Massachusetts bar in 1951. He first joined the Criminal Division of the u.s. justice department as a prosecutor. The next year, he managed his brother John's senatorial campaign, and in early 1953, he was appointed an assistant counsel to the Senate Permanent Subcommittee on Investigations, which became the bully pulpit for the anti-Communist witch-hunts of its chairman, Senator joseph r. mccarthy. Kennedy worked under McCarthy's foremost ally, Chief Counsel roy cohn, and investigated international shipping to Communist China, before resigning over disgust with McCarthy in mid-1953. Historians view his role in the Red Scare created by the proceedings to have been very limited, although some have argued that Kennedy was initially blind to Senator McCarthy's agenda. Kennedy rejoined the sub-committee in 1954, and became its chief counsel and staff director in 1955. Under the new leadership of Senator john mcclellan, the subcommittee turned its attention to labor Racketeering. Kennedy focused on corruption in the International Brotherhood of Teamsters. Heading a staff of sixty-five investigators, he squared off against the union's presidents, David Beck and james r. hoffa, in dramatic public hearings at which he often was accompanied by his brother John. Kennedy and the subcommittee believed the union had connections to Organized Crime; the union viewed Kennedy as a show-off who was persecuting it for his own political benefit. The union leaders frequently took the Fifth Amendment, refusing to answer questions under Kennedy's relentless grilling. Beck resigned and was later convicted; Kennedy became a national figure. The hearings began a long-running feud between Kennedy and Hoffa that would continue into the 1960s. Kennedy later devoted considerable resources of the Justice Department to prosecuting Hoffa, ultimately convicted in 1964 for jury tampering, Fraud, and conspiracy in the handling of a Teamster benefit fund. In 1960, Kennedy managed his brother John's presidential campaign. His reward was the position of attorney general, an appointment that brought widespread criticism of the president-elect for nepotism. But Kennedy's brother stood behind his decision, and thus began a relationship unique in presidential history: throughout foreign policy crises in Cuba and Vietnam, domestic unrest over Civil Rights, and especially the day-to-day functioning of the White House, Kennedy served as his brother's closest adviser. The two also shared a common problem in the person of Director j. edgar hoover, of the Federal Bureau of Investigation (FBI), who secretly kept tabs on them while intensifying the FBI's domestic spying during the Kennedy administration. The greatest crisis facing Attorney General Kennedy was the civil rights movement. The slow pace of change had frustrated civil rights leaders and mounting violence—from beatings to murder—brought pleas to the White House for intercession to protect demonstrators. During the Freedom Rides of 1961, for example, when busloads of black activists sought to integrate bus stations in the South, the movement's leaders appealed for help. Kennedy dispatched Justice Department representatives to Alabama; asked for assurances of protection from Governor John Patterson, of that state; and brought suit to win a court order on behalf of the riders. The administration was reluctant to do more because of concerns about limitations on federal power. Then, in May 1961, after more terrible assaults on the activists in Montgomery, Alabama, the attorney general dispatched five hundred federal marshals to Alabama. Yet the protection rendered did not stop local authorities from arresting, jailing, and beating activists. The reluctance of the White House to intercede more forcefully had a political rationale as well: the new Kennedy administration had won election by a small margin that included southern support. As critics have noted, concerns about federal authority did not stop the attorney general from later authorizing Director Hoover to place wiretaps on the Reverend martin luther king, jr., whom the pro-civil rights White House treated as an ally. Hoover's concerns about King's alleged Communist ties affected the Kennedys. As Kennedy later told an interviewer, "We never wanted to get very close to him just because of these contacts and connections that he had, which we felt were damaging to the civil rights movement." Nor did Kennedy balk at approving the appointment of William Harold Cox, an out-spoken racist, as a district judge in Mississippi, for reasons of political expediency, although he later regretted having done so. In time, Kennedy and the president took bolder steps—in 1962, sending five thousand federal marshals to quell rioting in Mississippi, after james h. meredith became the first black man to enter the state's university, and later, securing King's release from jail in Birmingham, Alabama. "Some men see things that are, and ask 'Why?' I see things that never were, and ask 'Why not?'" The assassination of his brother John in 1963 changed the course of Kennedy's life. Besides grieving the loss of his brother, he found he worked uncomfortably under President lyndon b. johnson, and he soon left the Justice Department. In 1964, he won election in New York to the U.S. Senate, where he served as a liberal voice until announcing his own bid for the presidency in 1968. Do we have a right here in the United States to say that we're going to kill tens of thousands, make millions of people, as we have … refugees, kill women and children? …I very seriously question that right….We love our country for what it can be and for the justice it stands for. Kennedy's candidacy sharply divided the Democratic Party between him and his opponent for the nomination, eugene mccarthy. Kennedy had won primaries in Indiana, Nebraska, and finally California, when he was shot at a campaign function on June 4, 1968, by Sirhan Sirhan, a Palestinian immigrant who said his motive was the candidate's support for Israel. The second murder of a Kennedy, following hard on the April 1968 assassination of King, was an immeasurable shock to the nation. It seemed to many to sound the death knell of an era. Kennedy's contribution to U.S. law is complex. In the 1950s, he helped expose corruption in the nation's unions, but critics have subsequently treated his very personal pursuit of Hoffa as an exercise not only in justice but in vendetta. When he headed the Justice Department in the early 1960s, his advocacy of civil rights had practical limitations imposed by political necessities and legitimate concerns about the balance of state and federal authority; groundbreaking civil rights legislation would, of course, follow in the years after his tenure. It was as a candidate for president that he may have been his most memorable, an ardent and inspirational voice. Through his opposition to the Vietnam War and his support for the disadvantaged, he offered the promise of a new idealism in politics. Guthman, Edwin O., and Jeffrey Shulman, eds. 1988. 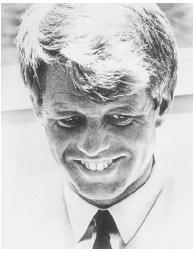 Robert Kennedy in His Own Words: The Unpublished Recollections of the Kennedy Years. New York: Bantam Books. Mills, Judie. 1998. Robert Kennedy. Brookfield, Conn.: Millbrook Press. "Remembering the Kennedys." 1984. Journal of American Studies 18 (December). Schlesinger, Arthur M., Jr. 2002. Robert Kennedy and His Times. Boston: Houghton Mifflin. Thomas, Evan. 2000. Robert Kennedy: His Life. New York: Simon & Schuster.